Brenta Dolomites - The access valleys and paths. 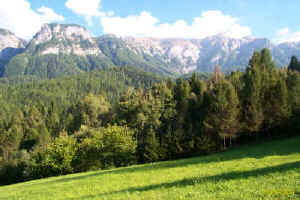 Valle dei Cornai. The climb up to the Costanzi-Albasini Bivouac along the Cornai Valley is rather demanding given the difference in height, even if it is not particularly difficult from the mountain-climbing point of view. 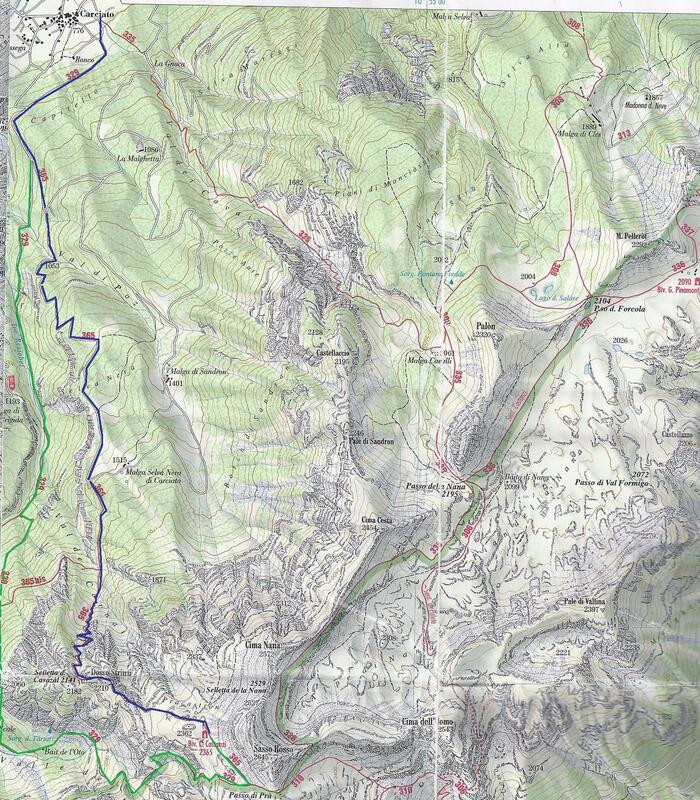 After crossing the Poz Valley, the route climbs up the Selva Nera to the Malga Selva Nera di Carciato. After a short, almost flat stretch, it climbs up the Cornai Valley keeping to the west as far as the small Selletta del Cavazal saddle where the route goes down slightly before tackling the luxuriant ridge of the Dosso Scrinzi. You come finally to the grassy expanses of the Prà Castron where the Bivouac stands under the Sasso Rosso peak. Main itineraries sentiero 329( 0 365) da Carciato al Bivacco Costanzi-Albasini . Maximum height m.2365, Bivacco Costanzi-Albasini . Sasso Rosso, Cima del Tov and the Vento Valley seen from the Meledrio Valley main road. 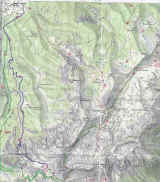 fork 365-365bis 1560 - - Path 365b intersects path 329 and a) going southwards you come to the Malga Scale, b) going northwards path 329 and 329b come to the Meledrio Valley main road.